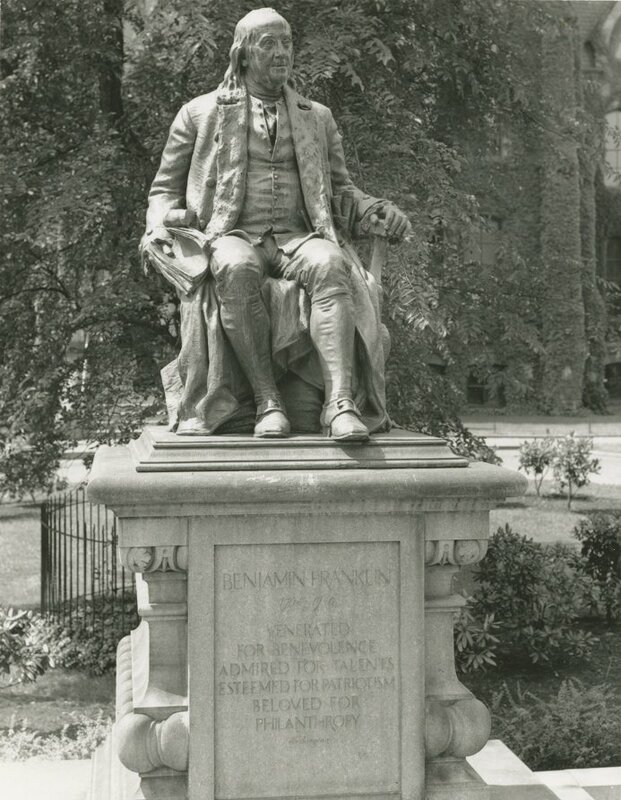 “Benjamin Franklin,” the statue that now stands in front of College Hall on the campus of the University of Pennsylvania was first commissioned in 1896 by Justus Clayton Strawbridge, of Strawbridge’s department stores, as a gift to the City of Philadelphia. 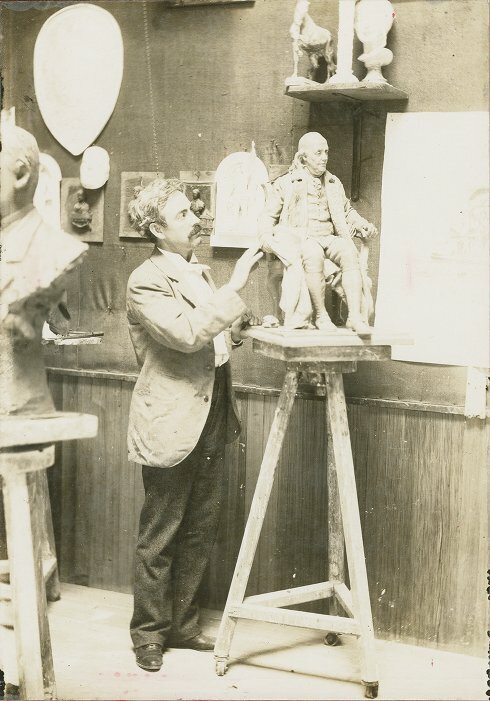 It was created by sculptor John J. Boyle, who received his training at Philadelphia’s Franklin Institute and the Academy of Fine Arts (where he studied with painter Thomas Eakins), as well as the École des Beaux Arts in Paris. 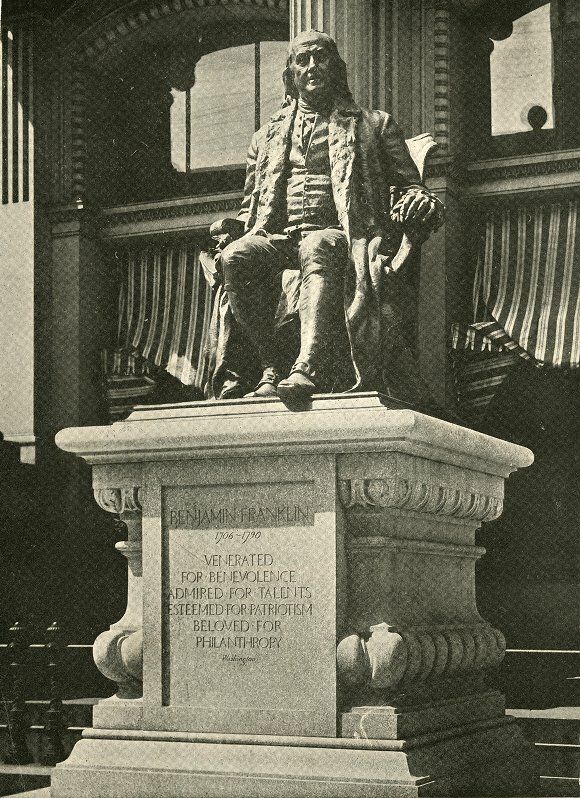 The statue was originally unveiled at the old United States Post Office building at 9th and Chestnut Streets in June 1899; this location was chosen because Benjamin Franklin had been the first Postmaster General of the United States. In a dedication ceremony at the Chestnut Street Opera House on June 21, 1899, an oration was given by James M. Beck, United States District Attorney of Philadelphia, and the statue was presented by the Honourable Charles Emory Smith, Postmaster General of the United States, in the name of donor Justus Clayton Strawbridge, to the City of Philadelphia and Mayor Samuel H. Ashbridge. The Post Office building (built 1873-1884) was demolished sometime around 1935 to make room for the new United States Court House and Post Office Building, built between 1937 and 1941. 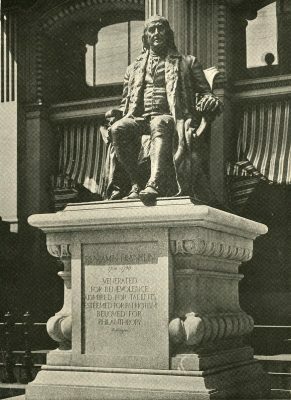 The statue of Benjamin Franklin was placed temporarily “upon a pile of cinders in the rear of the old building” during this time. 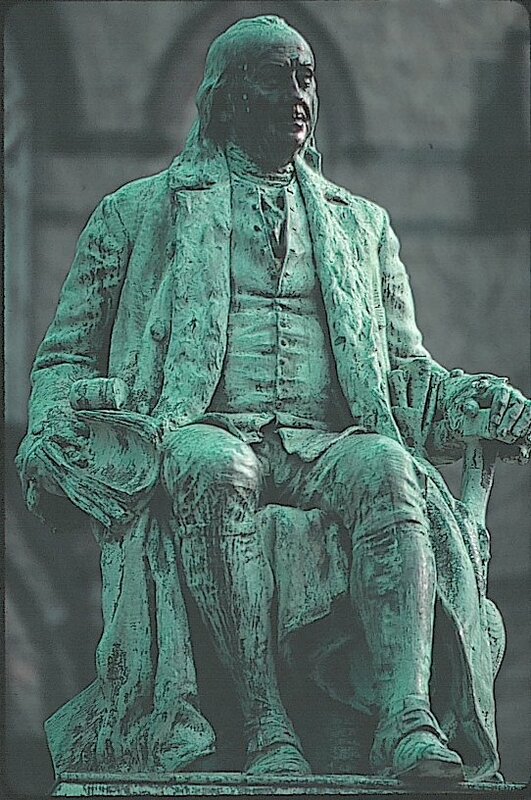 When this was reported upon in an Evening Bulletin article on May 19, 1938, several alumni immediately suggested to the University of Pennsylvania administration that the statue be relocated to its West Philadelphia campus, in recognition of Benjamin Franklin’s founding of the University. The admistration agreed, and permission was granted by City Council and Mayor Samuel D. Wilson for the relocation of the statue. The City of Philadelphia approved an indefinite loan of the statue to the University of Pennsylvania, subject to cancellation at any time with at least six months’ notice, in a resolution signed on June 3, 1938. The University would pay all expenses incident to the removal and installation of the statue. 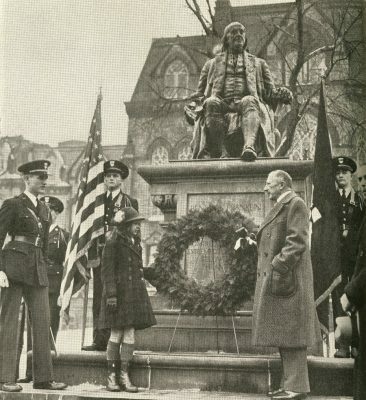 “Benjamin Franklin” was dedicated, in its current location, in a ceremony on Founders Day, January 21, 1939. University President Thomas Sovereign Gates gave an address, and the statue was formally presented to the University by City Solicitor Joseph Sharfsin. Ten year old Margaretta S.L. Duane, a direct descendent of Benjamin Franklin, placed a wreath at the foot of the statue; the University Band played and the Glee Club sange “Ben Franklin, Esquire,” by Charles Junkin (C’1877) and Edward McCollin (C’1878).